Dr. Brad Schaeffer is trained in the professional techniques of podiatry. He has gained valuable clinical experience in running and establishing a successful podiatric practice while developing management skills in a clinical environment since 2011. 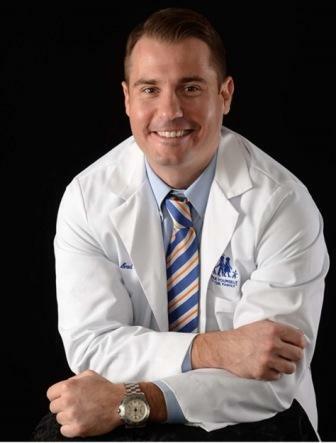 As a student, Dr. Brad Schaeffer worked hands on with patients at Temple University School of Podiatric Medicine clinic in Philadelphia, PA. from 2007 to 2011. During this time he examined and assessed various conditions in a clinical setting. Dr. Schaeffer had the opportunity to rotate through several departments within TUSPM. These departments included surgery, orthopedic department, wound care, podiatric medicine, diagnosis, physical therapy and radiology. He gained valuable knowledge in a clinical setting, successfully completed NBPME board part II and I and also became BLS and ACLS Certified. As a student doctor at Temple School of Podiatric Medicine, Dr. Schaeffer gained valuable knowledge in a classroom setting. He worked hands on with patients, pre and post op in a clinical environment. He became CPR certified and HIPPA trained. He had the opportunity to shadow doctors in various diagnosis of patients at Temples clinic and rotate through several different departments including radiology, wound care, anesthesia, operating room physical therapy, diabetes center of excellence, chestnut hill hospital rotation, mercy suburban hospital rotation, aria health system rotation, diagnostic evaluations and surgery rotation. Prior to his time at Temple University, Dr. Schaeffer attended Palm Beach Atlantic University in Palm Beach, FL. from 2002 to 2006. He was an Academic Scholar 3.3, Biology Major, Chemistry Minor and Business Minor. Scholarships earned were the Christian Leadership Scholarship, Sailfish Award and a Provost Scholarship. Dr. Schaeffer’s goal is to become an integral part of our office where he can gain valuable experience, assist with enthusiasm in every task at hand and have quality interactions with patients and knowledgeable attending’s. Schedule an appointment, so he may help you with your needs at Family Foot and Ankle Specialists. Give our Piscataway or Hillsborough office a call to request your appointment. For even more foot health tips, methods and information visit us at www.stopfootpainfast.com.